You're a lifesaver and I said so on my blog tonight. Thanks for everything! Have a great weekend. My husband was born here, I wasn't. I grew up a Cowboy fan, serious Cowboy fan. I've lived in Miami and Denver..and there is nothing like a Packer fan. I would roll my eyes last year when they'd talk about Farve and how amazing he was. I've always like him, he always seemed so down to earth and centered. But the whole idolization drove me nuts..and then today...today I got it. He's done. There won't be a 4 on the field with the Pack. Seriously? Makes me cry. As my family knows, I am not a big sports fan. 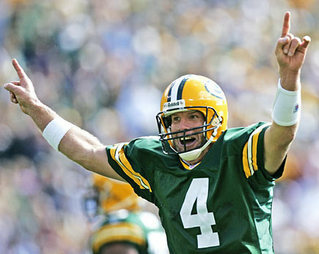 BUT, there is something infectious about Brett Favre, and it extends to the whole team. He plain out LOVES the game and when you watch him, you love it too. I am sad because this was the first year that I watched any games besides just the playoff games and the Superbowl game when the Packers were in it. We actually watched most of the games and we loved it and felt the ups and downs like real fans. We will miss you, Brett, you'll always be the best.